Judge: common sense will do! Justice Dean Mildren (pictured) today scoffed at a reference to the maximum penalty stipulated by the Sentencing Act, suggesting “common sense” would do better in considering submissions on sentence in the case of a young man accused of aggravated property damage. He was told by the Crown prosecutor that the maximum penalty for the offence was fourteen years’ imprisonment. “Fourteen years!” exclaimed Justice Mildren. The parliament obviously takes the matter seriously, replied the prosecutor without a great deal of enthusiasm, to which Justice Mildren responded that there is “nothing like common sense”. He went on to exceed the expectations of the defence and find that exceptional circumstances applied to the young accused. The property damage charge was all that had survived following two trials on more serious charges in which both juries failed to reach a unanimous verdict. The more serious charges have now been dropped. The damage was to a car which the man struck with a metal baseball bat in the course of an drunken altercation in a suburban street in September last year. Damage was estimated at $2000. The man pleaded guilty to causing the damage. It was suggested by defence counsel that he struck the car to ward off his attackers in the altercation, before retreating. The prosecutor could not accept that, arguing that the circumstances of the offence, a fight in a public place, could not be separated from the offence itself. Defence counsel said the offence had to be dealt with under Section 78B which mandates a sentence of imprisonment or a community work order, unless “exceptional circumstances” apply. He had already outlined the young man’s background: the 19 year old went to school until Year 12 in the Clontarf Academy program; after school he had tried a three month stint at Newmont Mine, but didn’t like being away from home; he then spent some time in Adelaide looking for work, before returning to Alice where he found a job in June this year. He is still with the company, hoping to enter an apprenticeship with them. He has a partner, who was present in court. Under cross-examination during the two trials he had been forthright and honest, expressing his remorse. 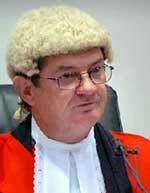 Justice Mildren wanted to know if defence counsel was asking for a finding of exceptional circumstances. No, he said, he was asking for a community work order. But Justice Mildren was of the view that exceptional circumstances applied: the young man had no prior convictions; he’d gone to the trouble of finding a job while going through the two trials; and there was also the disadvantage of his Aboriginality: “He’s done pretty well,” he said. The damage to the car would be ameliorated by restitution: he ordered that he pay $2000 in weekly instalments of $100; he convicted and fined him $750, added to which is the mandated Victim Impact Levy of $200 for an indictable offence.